Olympic gold medalist Shaun White defending his halfpipe title at last year’s Burton U.S. Open Snowboarding Championships in Vail (US Open photo). Just as Colorado gets to check out top Olympians in alpine ski racing every December at a World Cup event in Beaver Creek, nearby Vail gets to showcase snowboarding Olympians at the Burton U.S. Open Snowboarding Championships on Vail’s Golden Peak every March. Now in its sixth year in Vail, the Open this year follows hard on the heels of the 2018 Pyeongchang, South Korea Winter Olympics, and undoubtedly some of the world’s top riders will come into Vail March 5-10 sporting some new Olympic hardware. And then there all the great concerts associated with the U.S. Open. Burlington, VT (January 31, 2018) —Burton Snowboards announces the return of the 36th annual U.S. Open Snowboarding Championships to Vail Mountain March 5–10, 2018. As the final event of the competitive snowboarding season, following the excitement of the PyeongChang 2018 Winter Olympics, the Burton U.S. Open is positioned to showcase the world’s top athletes and most progressive riders, including 2018 Olympians, competing at the top of their game in perfectly sculpted slopestyle and halfpipe venues. In addition to top-tier snowboarding, the Burton U.S. Open features an expanded FREE Burton Concert Series featuring five nights of musical performances by some of the biggest main-stage touring bands, breakthrough musical acts and renowned DJs, plus the addition of late-night shows with special guests at Shakedown in downtown Vail. The Burton U.S. Open also continues to be a hub for fun FREE events, demos, and activities for the entire family throughout the five-day event. As the longest-running event in competitive snowboarding, the legendary Burton U.S. Open offers the world’s top riders the chance to take home a major title and add their name to the enviable roster of past winners, with spectators invited to take in all the excitement. Expect plenty of snowboarding action throughout all five days of competition kicking off on Tuesday, March 6th with the celebrated Burton U.S. Open Junior Jam featuring a field of the top halfpipe groms aged 14 and under—16 boys and eight girls—battling it out in the 22-foot superpipe. These young riders will be competing for a piece of the $2,000 prize purse and the opportunity to compete alongside the pros in Thursday’s halfpipe semi-finals. Don’t miss this look into the future of the sport! The pro competition gets underway on Wednesday, March 7th with the world’s top riders competing in the slopestyle semi-finals, followed by halfpipe semi-finals on Thursday, for a chance at the main event and the $343,000 prize purse. As the final event of this packed competitive snowboarding season, these riders will be ready to put down their most progressive runs in front of a cheering crowd to become part of history at the legendary Burton U.S. Open. 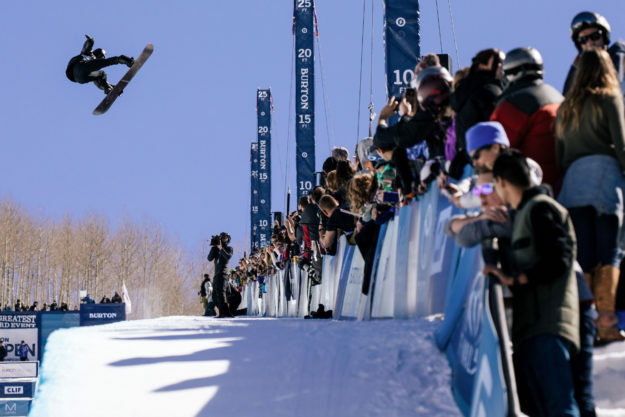 Last year Shaun White (USA) decisively defended his U.S. Open halfpipe title with a history-making run including a Cab double cork 1440 (his first in competition), to earn a 10-point lead. Likewise, Chloe Kim (USA) successfully defended her title, improving her score with each consecutive run with tricks including a massive frontside 1080 tail grab. In slopestyle, Anna Gasser (AUT) won her first Burton U.S. Open title by putting down arguably the greatest women’s slopestyle run of all time, with heavy rail combos and massive airs that included a Cab double underflip. Mark McMorris (CAN) dominated men’s slopestyle with a run that featured spins all four ways including a huge switch backside triple cork 1620 melon—the first time he had ever landed this trick in a slopestyle contest. 2018 marks the sixth year in a row that the Burton U.S. Open will be held at Vail Mountain where fans and families are invited to get in on all of the action on-hill and off. Burton will once again provide free snowboard and binding demos for riders to try out all of the newest 2018 equipment. Attendees will also have the opportunity to experience the new Step On™ premium on-snow demo experience. Burton Girls will also be offering demos and a free Burton Girls Ride Day for the ladies. And kids ages 3-6 years will be able to session the kids learn-to-ride Riglet Park, plus try out free Burton demo equipment and lessons. The excitement of the Burton U.S. Open continues in the Town of Vail with an expanded FREE live Burton Concert Series (full entertainment announcement coming soon!) with musical acts set to perform on the Solaris outdoor concert stage and the newly-added Shakedown indoor venue. Attendees can also join in the fun at participating bars and restaurants throughout Vail Village offering daily Après All Day food and drinks specials, live broadcasts of the slopestyle and halfpipe events, plus giveaways and contests. Additional activities include product sampling, demos and giveaways in the Sponsor village at Golden Peak; exclusive U.S. Open gear at the Burton Pop Up Shop at the base of the slopestyle course and at Burton.com, plus opportunities to meet the pros, the annual Chill fundraiser, the closing party at the Dobson Ice arena and much more! Be sure to download the Burton U.S. Open App for all information around the 2018 Burton U.S. Open, including the competition, event and programming schedule, rider bios, results and more. The app is available now through Google Play and the App Store. Also follow #BurtonUSOpen and catch all five days of action online with slopestyle and halfpipe finals airing live on Red Bull TV and locally in Colorado on TV8 and all other semi-finals and Junior Jam competition airing live on BurtonUSOpen.com. The finals competitions will also be broadcast nationally on FS2—check your local listings for Friday and Saturday airtimes. A big thank you to the following partners for their support of the 36th annual Burton U.S. Open: Burton, Toyota, Town of Vail, Pacifico, Clif Bar & Company, Paul Mitchell, G-Shock, Microsoft, Stoli, Rethink Water, Jack Daniels and Vail Mountain.